Organizations MUST have attended a grant workshop on either 2/5/19 or 2/13/19 to be eligible to apply. This grant cycle offers tax-exempt organizations four types of grant opportunities to address different areas of need in their operations, programming, capital, and sustainability. Organizations may submit one (1) application in one of the following areas from February 1 to March 22. Only one (1) application from each organization will be considered. A grant to help nonprofits formulate and/or implement resource development efforts for a strategic purpose as it relates to their operations. Fundraising: Includes costs associated with developing a fundraising plan, executing an annual campaign, etc. Marketing: Includes development of new marketing materials, website design, advertising, social media enhancement, etc. Staff, Board, and Volunteers: Includes capacity-building efforts associated with staff training and development (ex. conference or workshop), internship program development and hiring, board training, volunteer recruitment and training, and strategic plan development. Staff salaries will only be considered with proof of program enhancement and must be accompanied by a written sustainability plan. Technology: Includes information technology support, website maintenance, etc. Does not include purchase of equipment (see Capital Improvement). Requests for cost of office space rent, utilities, travel expenses, and staff benefits will not be considered. These funds are not meant to sustain recurring operating costs from year to year. If your organization received a Strategic Operating Support grant in 2018, you are not eligible to apply in this category in 2019. A grant to support or expand an existing charitable program/project or to create and launch a new charitable program/project. A grant to support capital purchases with an expected useful life of 12 months or more, such as building repairs or additions, purchase of new equipment, purchase of technology (hardware & software), vehicles, and furniture. A grant to seed a new agency endowment with HCCF that will provide perpetual operating support for the organization. Award must be matched 1-to-1 in order to receive grant. Organization must be in conversation with HCCF’s development team to apply for this grant. Requests must be for $1,000 or less. Requests for emergencies or immediate needs will be given priority. Requests should be for a one-time expense. Mini Grants will not sustain operating or programming costs from year-to-year. Mini Grant requests to cover a portion of a new ongoing expense must explain the plan for future sustainability. The implementation of Mini Grant requests should fall outside the Annual Grant Cycle timeframe. Mini Grant requests received during the Annual Grant Cycle application cycle must either be 1) an emergency request where funding is needed immediately or 2) a request for a small, one-time project under $1,000. Organizations may only receive one (1) Mini Grant per calendar year. Mini Grants are administered on a rolling cycle each calendar year. Applications are accepted and evaluated on a first-come, first-served basis until funds available for the calendar year are gone. If you have a request that falls within these parameters, please contact Katie Ottinger at kottinger@givehcgrowhc.org to request an application. The purpose of the Connecting Community Fund is to encourage residents to meet each other, socialize, and enjoy nature in public places. Maximum request is $1,000 per organization. This is a rolling grant cycle that will remain open for the remainder of 2018. Funds will be awarded on a first-come, first-served basis until the fund balance is depleted and will open again in 2019. If you believe your organization has a project or an idea that would meet the spirit of this fund, please contact Katie Ottinger, using the contact information below. Questions about grants should be directed to Katie Ottinger, Community Investment & Grants Officer, who can be reached at 317.462.8870 extension 233 or kottinger@giveHCgrowHC.org. This award, named in honor of long-time Hancock County resident and philanthropist Martha Beckenholdt, recognizes a Hancock County high school junior who has contributed outstanding time, talent, and energy to philanthropic endeavors. These are the true attributes of the woman whom the award honors. The award recipient will select a Hancock County nonprofit organization or agency to receive a $1,000 grant in his or her name, donated by the Hancock County Community Foundation. Applicants must be Hancock County high school juniors with a recommendation from a high school staff member or nonprofit organization leader located in Hancock County. For the purpose of Hancock County Community Foundation grants, a grant is a monetary award to a nonprofit organization for a specific project or purpose. Organizations interested in receiving a grant from Hancock County Community Foundation should read below to learn about eligibility and requirements for HCCF’s grants. Grants are generated from endowment funds administered by HCCF. To learn more about our many types of funds including Nonprofit Operating Funds, please click here. The Community Foundation establishes an annual grantmaking program that is available on a competitive basis to qualified nonprofit organizations serving Hancock County. Each grant opportunity has its own criteria used to evaluate applications. We welcome and encourage contact from organizations that are considering applying for a grant and are happy to clarify and respond to questions concerning policies, guidelines, or application procedures. We require that organizations use the Community Foundation’s application forms. Current HCCF grant opportunities can be found here. Due diligence is the process of review and assessment of an organization to determine grant eligibility. Grants will not be awarded from any fund type until HCCF staff completes due diligence to assure the below grantee eligibility and award criteria are followed. Each grant opportunity may have additional eligibility requirements and award criteria. A public, tax-exempt origination defined by Section 501(c)(3) of the IRS Code. * Government agencies, municipalities, and churches are eligible under this requirement. Must be in good standing with HCCF, meaning evaluation reports on all previous grants have been filed. *Exception – If you do not have a 501(c)(3) status, you may enter into an agreement with a qualified non-profit that will act as your fiscal sponsor. **Nonprofit status confirmed through GuideStar Charity Check and completed by HCCF Staff. The grant award supports a charitable purpose. The grant award does not benefit the fund advisor(s) or members of the HCCF Grant Committee and Board of Directors. The grant award does not fulfill a pledge. To use funds granted solely for the stated purpose. To repay any portion of the amount granted which is not used for the purpose of the grant or expended prior to the termination of the grant period. To return any unexpended funds if the grantee loses its exemption from federal income taxation as provided under Section 501 (c) (3) of the Internal Revenue Code. To maintain program and financial records adequate to verify expenditures and activity related to the grant. Submit a completed grant evaluation as outlined and described in the grant agreement. To provide acknowledgement of Hancock County Community Foundation’s role in any publicity regarding the grant and to provide pictures of the project to HCCF. Applications for religious indoctrination or other religious activities, non-HCCF administered endowment building, deficit financing, fundraising, lobbying, electioneering, and activities of political nature will not be considered, nor will proposals for ads, sponsorships, and any proposals which discriminate as to race, gender, marital status, sexual preference, age, disability, creed or ethnicity. Additionally, HCCF grants will not reimburse expenses committed for projects, programs, capital improvement, and/or equipment. In selected cases, projects undertaken by organizations that normally fall outside the above guidelines may be able to receive funding. Examples include: religious organizations whose proposal impacts the broader community; or units of government whose proposal extends beyond the traditional governmental functions that impact the broader community. No grants will be made solely to individuals, but can be made for the benefit of certain individuals for such purposes as scholarships and special programs through educational institutions and other sponsoring recipient organizations. What does HCCF look for in a Grantee? The Hancock County Community Foundation looks for grantees that align with our vision for Hancock County in which each person has the opportunity to pursue dreams, enjoy daily life, and invest in meaningful causes. 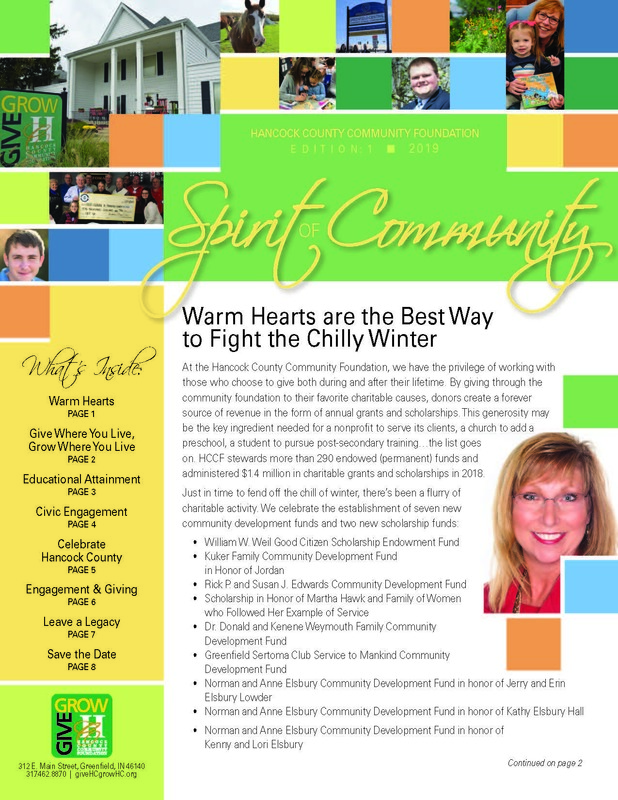 HCCF’s grant initiatives and opportunities change each year. We invite you to contact our office to learn about specific requirements and opportunities. We strongly advise that you seek the assistance of the Hancock County Community Foundation staff if you have any questions or difficulties with the grant application process. We are here to help you with your grant application. Each grant opportunity may have additional grant writing tips for you to consider. Include ALL required documentation with the Grant Proposal. Follow the instructions completely. Provide a reasonable, detailed budget of the project seeking funding. Grant committee members will recognize under-budgeted or padded requests. Do your homework on costs. Provide price lists or written estimates as attachments. Include competing estimates or bids if the work/project is to be contracted. Statistics are helpful to justify your proposals, but statistics specific to Hancock County will provide better justification for funding. How many Hancock County residents will be served by your program? What is the source and relevance of your statistics? Avoid jargon, abbreviations and acronyms. Ask someone who is not familiar with the project to read and critique your application. Will they be able to understand and clearly explain what your project is, the costs, the results of what you hope to achieve? The grantee must complete and submit to HCCF a Grant Evaluation Report based on the time frame outlined in the grant agreement document. Most HCCF grants require that the grant evaluation be submitted as soon as funds are expended or by the date given in the grant agreement based on the grant award date, whichever comes first. Failure to complete and submit the Grant Evaluation Report will have a negative impact on any future funding opportunities. This spring, HCCF granted $175,785.42 to more than 40 organizations serving Hancock County! The 2018 Spring Grant Cycle was open to any 501(c)3 organization serving Hancock County. The available grant categories were Strategic Operating Support, Program and Project Support, Capital Improvement, and Endowment-Building. This grant cycle had a total of $128,532.42 available to grant from a collection of HCCF’s unrestricted resources and field of interest funds. To see a list of all grantees from these cycles, please click here. 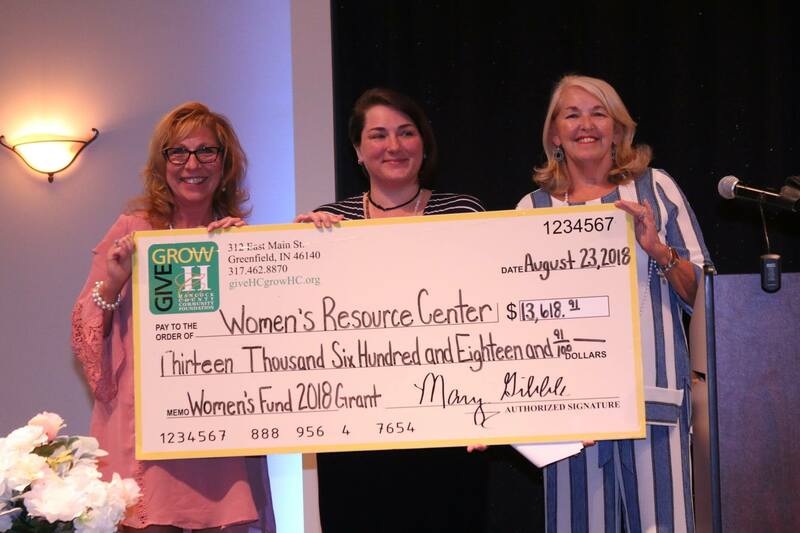 Members of the Women’s Fund of Hancock County were invited to nominate an organization that has a program that invests in a woman’s journey to self-sufficiency so she can best support and/or sustain herself and her family. Of those nominees, three eligible nominated organizations were randomly selected to receive grant funding. 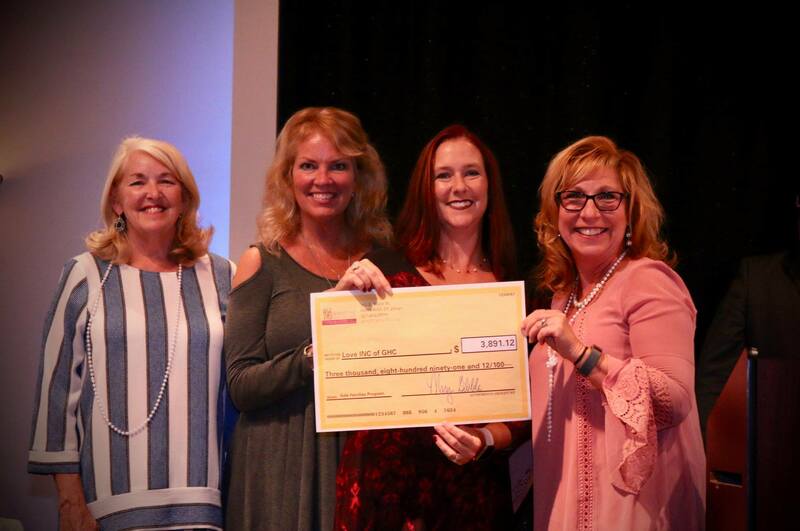 Each member could vote for one organization, and the funds were distributed at the Power of the Purse event on August 23 based on the percentage of votes received. 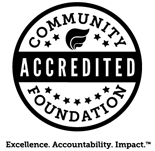 The White Family Foundation Fund is a donor-advised fund of HCCF. Donor-advised funds allow donors to simplify and consolidate all their charitable giving and provides the family the opportunity to make grant recommendations from their fund to HCCF in order to address community needs. HCCF assures the charitable qualifications of recommended grantees and handles all the administration details. As a way to give back, the White Family supports initiatives that enhance the desire to live, work, and play in the communities where they have provided business services. They consider applicants through thoughtful conversation as a multi-generational family. Stephanie White-Longworth and Keith White, previous owners of GasAmerica Services, Inc., lead the family’s philanthropic efforts. They now own Pride Investment Partners, LLC (formerly K&S Holdings, LLC), which is operating under a corporate brand reflecting the company’s growth in real estate and private equity investments. Since 2012, Pride Investment Partners has operated out of Greenfield with a variety of investments throughout Indiana and Ohio, including investments in retail – such as hotels, strip centers and retail stores – and in residential and commercial real estate. 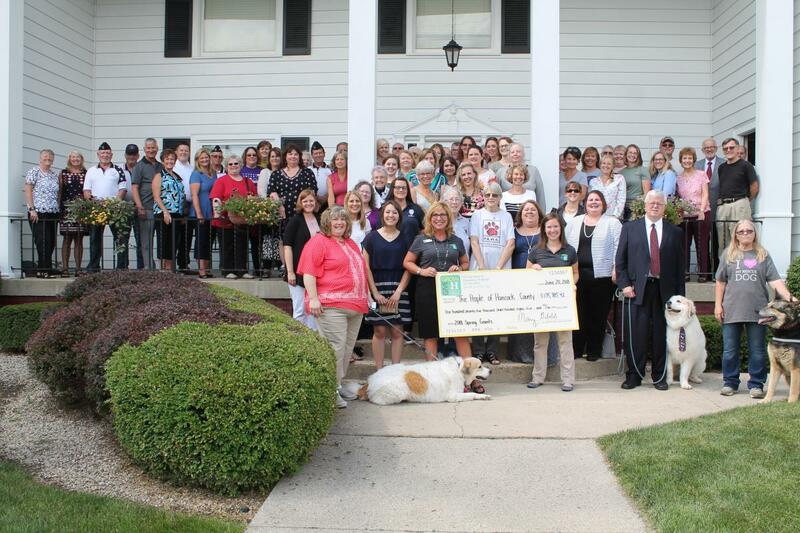 The Hancock County Community Foundation (HCCF) recently awarded Leadership Hancock County a grant from the Connecting Community Fund, a component fund of HCCF. The $1,000 grant will help a project group host the Get ‘Cycling event on May 18 in the Courthouse Plaza and Annex parking lot in Greenfield. The event will take place from 10 a.m. to 2 p.m. and combines activities of a Bicycle Rodeo and Keep Greenfield Green. Children and families can participate in bicycle safety exercises, enjoy arts and crafts, listen to music and more. There will be education, demonstrations and giveaways from local businesses. Craft stations will teach art projects with recyclable materials. Roy Ballard, Purdue Extension, will demonstrate composting, Dani’s Dreams will provide an Eco Lesson and local waste management companies will be on hand to allow families to sign up for recycling programs. There will also be food, music and a bounce house. The event is free to the public. The Hancock County Community Foundation (HCCF) recently awarded a grant from the Connecting Community Fund, a component fund of HCCF, to the Jane Ross Reeves Octagon House in Shirley. On June 22, the Jane Ross Reeves Octagon House will be celebrating its 140th birthday. The Wright Family will provide a free concert and there will be free tours of the house as well as refreshments. The grant will pay for a tent for the celebration. The public is invited to attend to enjoy the band, the house and the grounds. 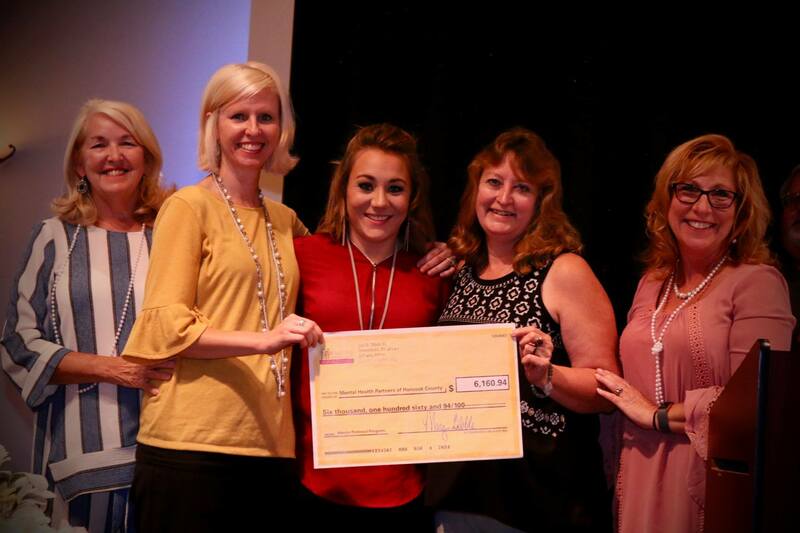 The Hancock County Community Foundation (HCCF) recently awarded a $1,000 grant from the Connecting Community Fund, a component fund of HCCF, to Dani’s Dreams Innovation in Education Corporation. Dani’s Dreams will partner with community organizations and fellow nonprofits to offer “pop-up” Eco Lessons at various locations during March, April and May. The goal is to help people celebrate the joy found in discovery and spread awareness of sustainability and environmental education throughout Hancock County. 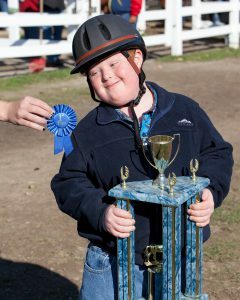 Organizations interested in partnering with Dani’s Dreams are encouraged to visit its website to learn more about its programs at www.danisdreamscorp.org. 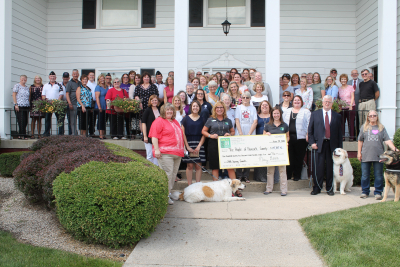 The Hancock County Community Foundation (HCCF) recently awarded $620 grants from the Connecting Community Fund, a component fund of HCCF, to four Hancock County organizations for 2019 activities. 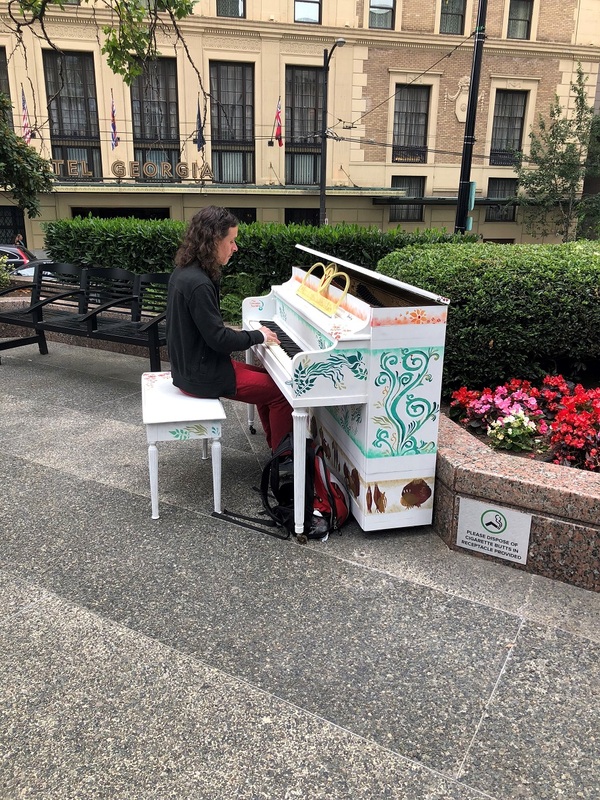 HCCF supports opportunities that encourage residents to enjoy community gathering spots and activities where people can play, eat, learn, and socialize. New Palestine Main Street has plans to use the grant to help fund their upcoming Summerfest which will include a festival, 5k run, car show, free concert stage, entertainment, children’s play area, and fireworks on June 22, 2019. 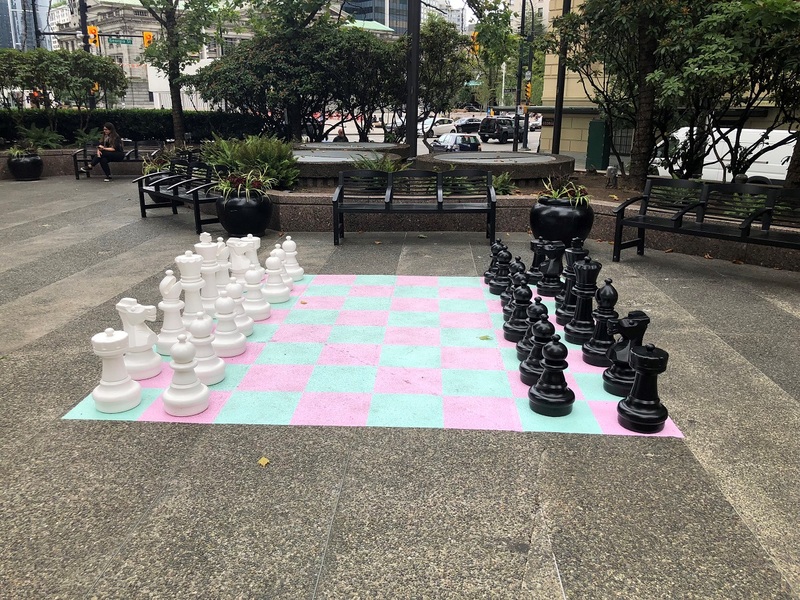 Fortville Action, Inc. will use their grant to help fund an ArtBattle and two other arts festivals this year, as well as a summer concert series at Landmark Park. 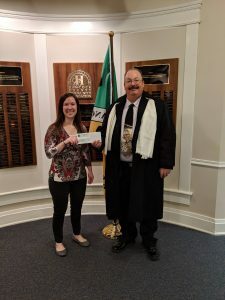 Greenfield Main Street will use their grant to help fund the Shamrock the Block on March 15 and Boos and Brews on October 25 as well as expenses for a public Stellarbration Celebration later this year. Shirley Community Visionaries will use their funds to help cover expenses for the Shirley Sounds of Summer Outdoor Concerts on the third Saturday of each month this summer. 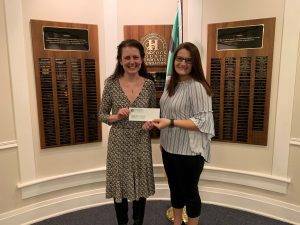 The Hancock County Community Foundation (HCCF) recently awarded the Hancock County Historical Society a grant from the Connecting Community Fund, a component fund of HCCF. The $1,000 grant allowed the Historical Society to bring the Sammy Terry Show to the HJ Ricks Centre for the Performing Arts in Greenfield. 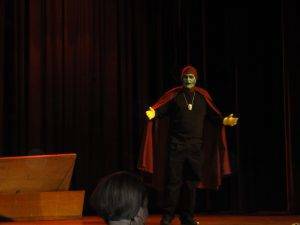 The event took place on Oct. 6, and the evening of listening to the Sammy Terry character reminisce about his TV run included a costume contest and a viewing of the 1968 classic, “Night of the Living Dead” movie. 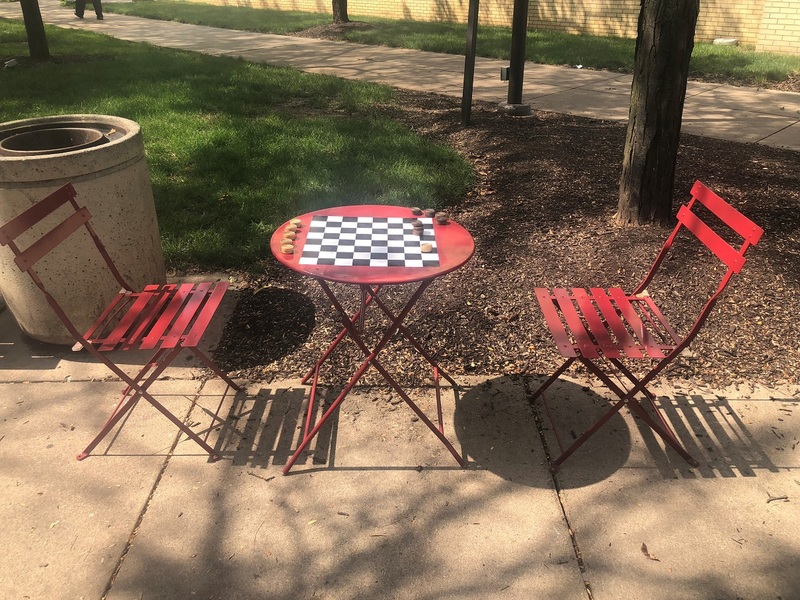 Created by HCCF, the Connecting Community Fund is a fund that provides support to opportunities that encourage residents to meet each other, socialize, and enjoy nature in public places. 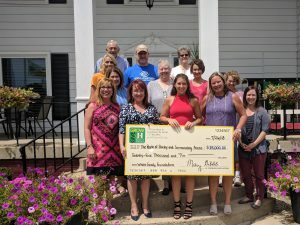 The Hancock County Community Foundation (HCCF) recently established the Hancock County Mural Fund as a vehicle to receive gifts to support murals and art projects throughout the community. 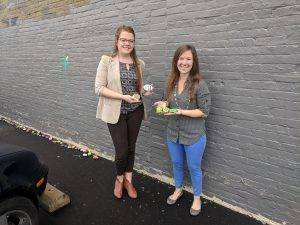 HCCF’s $5,000 grant combined with gifts from fellow funders supported the first benefactor of the fund, Greenfield’s newest hand-painted mural. 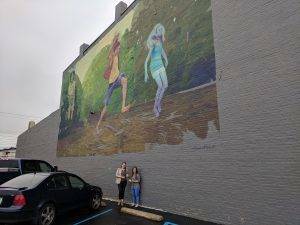 The mural captures the elements of the James Whitcomb Riley poem titled “A Barefoot Boy.” The internationally acclaimed artist, Andrew Heim, did his homework to bring the boy and his friends to life. The mural, completed on September 19, is located on the west wall of 20 W. Main St., adjacent to the North Street Living Alley. 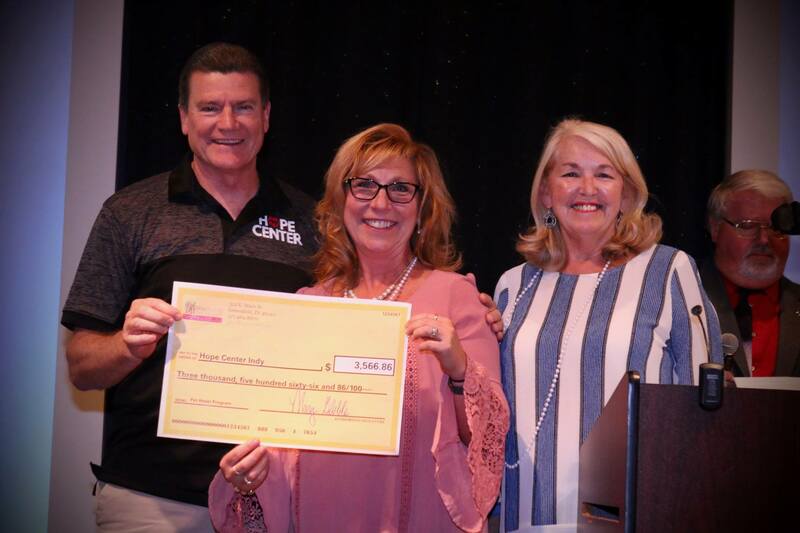 HCCF awarded a $1,000 “Connecting Communities” grant to the City of Greenfield to support a pop-up event called “Rock Party” on September 21. People of all ages decorated and painted the creek bed rocks to adorn the base of the mural. Face painting, selfies, and refreshments complimented the fun. Mural visitors are invited to take a rock as a souvenir during Riley Days. 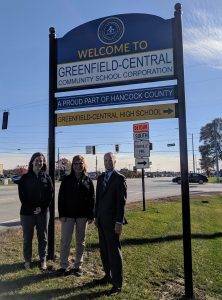 The Hancock County Community Foundation (HCCF) awarded the Greenfield-Central Community School Corporation a grant of $15,000 to place identification signage at the school district boundaries. The school system completed the placement of 12 signs this fall with the help of the grant. In 2017, Mt. Vernon Schools inspired this HCCF initiative when they partnered with the Towns of Fortville, McCordsville, and Cumberland to install signage across the school district. Both new and replacement signs were designed with the help of an HCCF grant. The signage celebrates the school and the communities it serves. This spring, HCCF invited Eastern Hancock, Greenfield-Central, and Southern Hancock schools to do the same. HCCF has earmarked $30,000 in 2019 for Eastern Hancock and Southern Hancock schools to install uniform signage. The Hancock County Community Foundation (HCCF) recently awarded the Town of Wilkinson a grant from the Hancock County Enrichment Fund, a component fund of HCCF. The $1,000 grant will help the town repair its tornado siren that was damaged by a lightning strike. Created by HCCF, the Enrichment Fund is a comprehensive, unrestricted fund that addresses a broad range of needs, including future needs that often cannot be anticipated. It helps support long-term solutions, respond quickly to emergencies, and meet changing social, cultural, educational, and environmental needs in the community. The Hancock County Community Foundation (HCCF) recently awarded two grants from the Agricultural Heritage Fund, a component fund of HCCF. 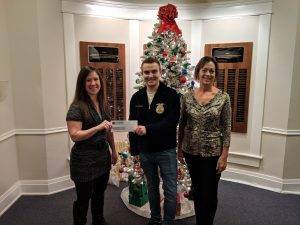 The Greenfield Central School Foundation received a $1,000 grant for the Greenfield-Central High School FFA to use for crop production practices, management and merchandising. The Mt. Vernon Education Foundation received a $1,000 grant to expand the Mt. Comfort Elementary learning garden project. Funding from this grant also came from the Hancock County Enrichment Funds. A member of HCCF’s Spirit of Community fund family, Agricultural Heritage Fund grants sustain the spirit and rich history of our agricultural heritage by supporting activities associated with agriculture education, youth organizations, and other related agriculture programs in Hancock County. The Hancock County Enrichment Fund, created by HCCF, is a comprehensive, unrestricted fund that addresses a broad range of needs–including future needs that often cannot be anticipated at the time your gift is made. The Enrichment Fund helps support long-term solutions; respond quickly to emergencies; and meet changing social, cultural, educational, and environmental needs in our local community. If you would like to subscribe to our monthly Nonprofit News email full of information for Hancock County nonprofits, please complete this form. Questions about accessing this page should be directed to Katie Ottinger, Community Investment & Grants Officer, who can be reached at 317.462.8870 extension 233 or kottinger@giveHCgrowHC.org.